Ryview #3 is also a genre I don't delve into much, it's the flash strategy game Pirates: Tides of Fortune, by PlariumGames. I don't really do the whole flash strategy game thing. I've delved into flash RPGs on occasion, but usually I rely on the big heavy hitters for those. Obviously, in the spirit of this blog, I want to be here to help those of you who don't want to pay for the big tickets items like that, so onward I tread. I've had some good experiences with pirate games in the past. I love Treasure of Cutlass Reef (made by Gemcraft creator Gameinabottle), and there are several more that held my attention for much longer than the average flash game. This game is set up a bit like Civilization, where you have your own little plot of land and you're building improvements to increase income. There are advisers, there are upgrades, all standard strategy elements. 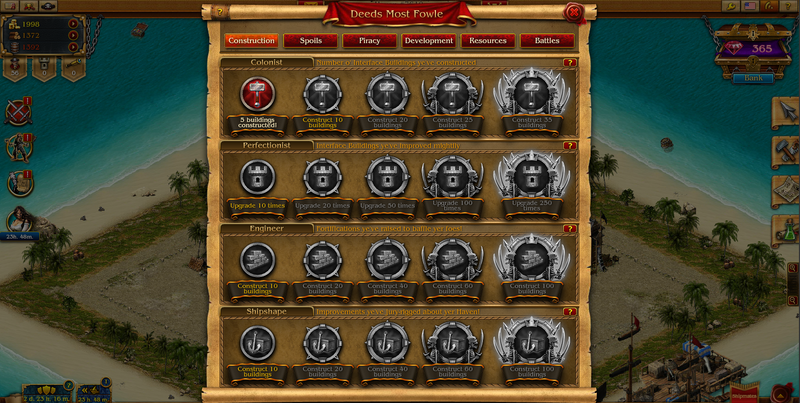 The tutorial tasks will hand feed you the beginning of the game. It really slogs through without any real gamer contribution. It's fine to learn to game, but anything that takes you that long to get through really should require more input to keep the gamer entertained. I don't know, maybe it's just me, but my mind wandered while the game told me what to do for 30 minutes. Similar to some Facebook style strategy games (backyard monsters) you can attack and be attacked by friends and other players. You're thankfully invulnerable for your first 3 days, and as of this writing I have not passed the 3 day mark, but if it's like similar games, I can probably expect to get all of my s*** f***** up pretty fast once other users have free reign. You have some random encounter ships to pillage, and you can build up your city and defenses. In my opinion, this game seems quite a bit more trouble than it's worth. Very complicated, very deep, but I really doubt it will ramp up its interesting factor any time soon. It seems very straightforward. If you like farmville style games where you can build up a city and then steal from your fellow players, this game is for you. But let me tell you, I like single player and I like cooperative gameplay. I'm okay with Halo style competitive multiplayer, but even that drains me of my dignity and patience pretty quickly. I must say, though, this does have upgrades, it has in game achievements with rewards, it has a lot of depth. I really want to convey that while I don't really think this is my cup of tea, if you like this style of game, this is probably one of the best ones out there. My scorecard will reflect that so I will weed out my bias. Let me know what you think of Pirates: Tides of Fortune!